Boyle, S., J.D. Litzgus, and D. Lesbarrères. , Road surveys vs. circuit theory to predict hotspot locations: benefits and challenges for implementing road-effect mitigation. Biodiversity and Conservation (doi: 10.1007/s10531-017-1414-9). Colley, M., S. Lougheed, K. Otterbein, and J.D. Litzgus. , Mitigation reduces road mortality of a threatened rattlesnake. Wildlife Research 44(1): 48-59 (doi: 10.1071/WR16130). Edge, C., N. Rollinson, R. Brooks, J. Congdon, J. Iverson, F. Janzen, J. Litzgus. , Phenotypic plasticity of nest timing in a post-glacial landscape: How do reptiles adapt to seasonal time constraints? Ecology 98(2): 512-524. Keevil, M.G., B.S. Hewitt, R.J. Brooks, and J.D. Litzgus. , Patterns of intraspecific aggression inferred from injuries in an aquatic turtle with male-biased size dimorphism. Canadian Journal of Zoology 95: 393-403 (doi: 10.1139/cjz-2016-0182). Riley, J.L., J.H. Baxter-Gilbert, and J.D. Litzgus. , A comparison of three external transmitter attachment methods for snakes. Wildlife Society Bulletin 4(1): 132-139 (doi:10.1002/wsb.748). Moldowan, P.D., R.J. Brooks, and J.D. Litzgus. , Quantification of cranial and tomiodont dimorphism in Testudines using the Midland Painted Turtle (Chrysemys picta marginata). Zoomorphology 135(4): 499-510 (doi: 10.1007/s00435-016-0320-0). Moldowan, P.D., R.J. Brooks, and J.D. Litzgus. , Turtles with “teeth”: Beak morphology of Testudines with a focus on the tomiodonts of Painted Turtles (Chrysemys spp.). Zoomorphology 135: 121-135 (doi: 10.1007/s00435-015-0288-1). Sasaki, K., D. Lesbarrères, C. Tremblay Beaulieu, G. Watson and J.D. Litzgus. , Effects of a mining-altered environment on individual fitness of amphibians and reptiles. Ecosphere 7(6): e01360 (doi: 10.1002/ecs2.1360). Mui, A.B., C.B. Edge, J.E. Paterson, B. Caverhill, B. Johnson, J.D. Litzgus, and Y. He. , Nesting sites in agricultural landscapes are a potential sink for turtle populations. Canadian Journal of Zoology 94: 61-67 (doi: 10.1139/cjz-2015-0154). Laverty, J.F., B. Korol, and J.D. Litzgus. 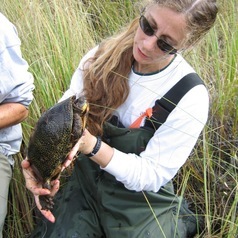 , Measuring the effects of water-based recreation on the spatial ecology of Eastern Musk Turtles (Sternotherus odoratus) in a Provincial Park in Ontario, Canada. Copeia 104(2): 440-447 (doi: 10.1643/CE-15-284). Baxter-Gilbert, J.H., J.L. Riley, D. Lesbarrères, and J.D. Litzgus. , Mitigating reptile road mortality: Fence failures compromise ecopassage effectiveness. PLoS ONE 10(3): e0120537. (doi: 10.1371/journal.pone.0120537). Sasaki, K., D. Lesbarrères, G. Watson, and J.D. Litzgus. , Mining-caused changes to habitat structure affect amphibian and reptile population ecology more than metal pollution. Ecological Applications 25(8): 2240-2254 (doi: 10.1890/14-1418.1).